Labor day is supposed to be the last weekend of the summer. To say goodbye to it, we went to the beach. I don't think I have ever told you how much I love the beach. I never get tired of it. We went to the Outer Banks in North Carolina, where some of my favorite beaches in America are. The weather was on an off, like a struggle between the sunny summer and the rainy fall. The beach was almost empty and the water was warm after all the summer months. It has been a great summer. It all started with the trip to Chincoteague. Then came Italy. After that, Almu's visit and our trip to NYC. Then a month in Spain with trips to Paris, Lisbon and Tarifa. Then my sister's visit and a second trip to New York City with her. And finally, the OBX. Wow, now that I think about it, it has been amazing! Now it's time to wrap up, put away the flip-flops and the summer dresses and say see you later, summer. And here is (what might be) this year's last summer recipe: cantaloupe and ham salad. I learnt this recipe from my mom, who learnt it from my aunt Papusa one time we visited her like a million years ago. 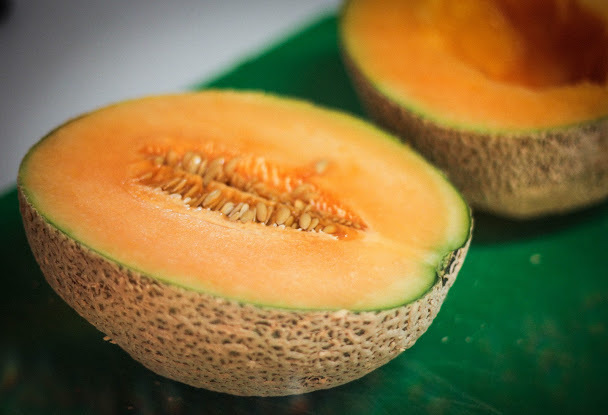 The only thing I have changed is the type of melon because in America I can't find the Spanish type of melon. 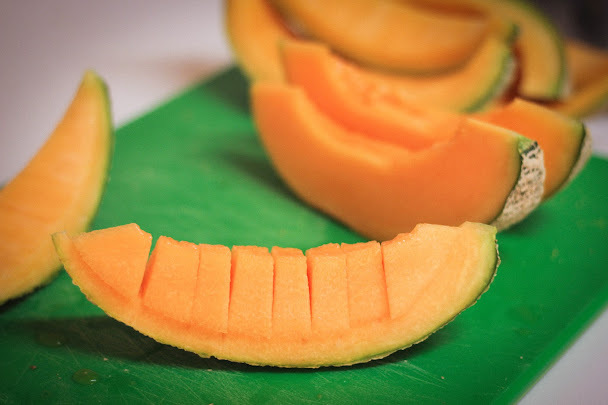 However, it can be made with any kind of melon as long as it is ripe and sweet. This is a much better version of the typical prosciutto and melon appetizer. It is refreshing, and the combination of flavors can't be any better. I don't know what else can I say about a salad, but I really want to convince you to make it. Make it know, when the cantaloupes are in season. 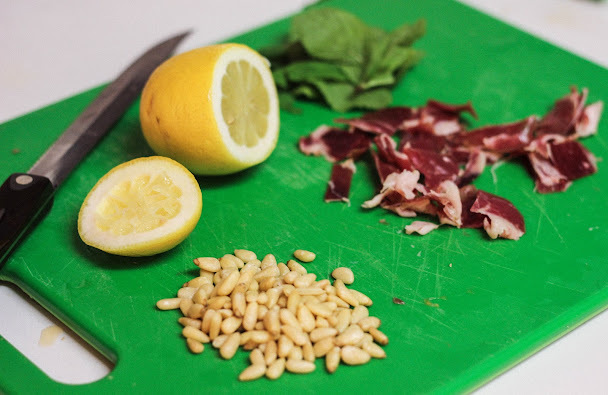 Make it with a good Serrano or Iberian ham if you can, or just try it with prosciutto or a cured ham of your choice. Do not forget the pine nuts because the add a great crunchiness to it. Do not ever skip the mint because that is the ingredient that wraps all the flavors and adds a super refreshing touch. 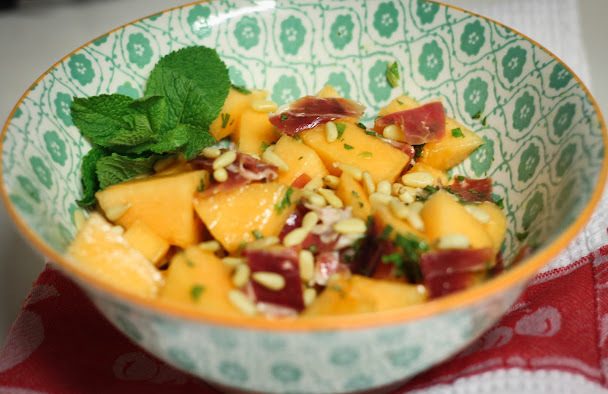 In a serving bowl add the melon, ham and pine nuts. Add the chopped mint and salt to taste. In a small bowl mix the lemon, vinegar and oil to make a vinaigrette. Pour the vinaigrette over the salad ( no need to use all, use as much as you like) and toss to coat. Refrigerate until ready to eat.